Enjoy our tropical island getaway, just 15 minutes away from Hilo. Hale Palekaiko means "House of Paradise"! This two bedroom and two bathroom single family home is fully equipped and ready for your arrival. Hale Palekaiko is perfect for a small family of four looking to get away and totally unwind. The home is setup truly as a home away from home. The kitchen is setup ready for you to cook breakfast, lunch or dinner. Grill out and enjoy your meal on the covered lanai overlooking a gorgeous tropically landscaped yard. The home is just a short drive from all the attractions in Hilo including Bayfront, Coconut Island, restaurants and the farmer's market. We are also just 40 minutes away from Volcano National Park. The AC unit is located in the living room and cools the entire home. There is not individual units in each room or central air. Each bedroom does have a ceiling fan. There are 3-4 steps leading up to the home. There is no ramp available and no specific handicap accessible features in the bathrooms. 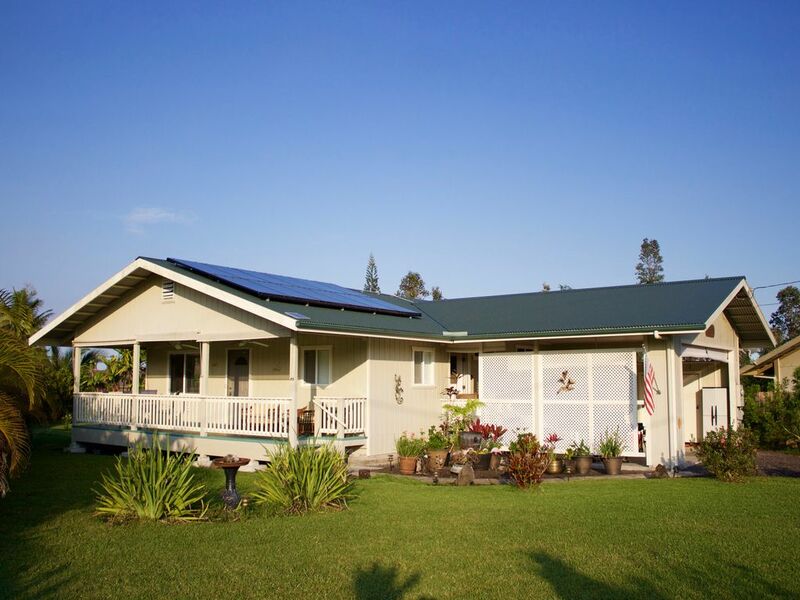 Great home base to view all the wonderful destinations on the eastern side of the big island! I wanted to experience this vast island without feeling rushed. While checking out the waterfalls and volcanos I stayed at Hale Palekaiko. This lovely home felt comfortable, safe, private, and very spacious. Very friendly owners that quickly responded to my needs. Gave wonderful ideas of new adventures to explore. Thank you for providing a top notch home base on the eastern portion of the island. Comfortable and relaxing home close to everything! Lovely house in quiet neighborhood. Well equipped kitchen, beautiful yards with lots of flowers, a banana tree and pineapples! The location was perfect for exploring all of the interesting sights located in and around Hilo. Brian and Angela Kroll were the best! So helpful to us upon arrival and answered all kinds of questions - thank you both for making us feel right at home. We enjoyed our stay very much! We had a wonderful time at this house. Unfortunately a hurricane came into town and we had to cut our stay short. We woul have loved to spend the extra time on this side of the island. The house was perfect for our family of 4. My favorite place was sitting on the front porch either drinking coffee in the morning or having dinner at night. We will definitely be back and hopefully a hurricane doesnt push us out early. V. Nice. Would stay there again. Great place to stay! Prayers for those close to the lava flows. Enjoyed your Big Island!